Kayaks were created thousands of years ago by the Inuit, formerly known as Eskimos, of the northern Arctic regions. They used driftwood and sometimes the skeleton of whale, to construct the frame of the kayak, and animal skin, particularly seal skin was used to create the body. The main purpose for creating the kayak, which literally translates to "hunter's boat" was for hunting and fishing. The kayak's stealth capabilities allowed for the hunter to sneak up behind animals on the shoreline and successfully catch their prey. In the 1740s, Russian explorers led by Vitus Bering came in contact with the Aleutians, who had taken the basic kayak concept and developed multiple designs specifically for hunting, transportation, and environmental conditions. They soon recognized the Aleutians were very skillful at hunting sea otters by kayak. Because otters were a popular commodity in Europe and Asia, they would exploit and even kidnap Aleutians and keep them aboard their ships to work and hunt. By the mid-1800s the kayak became increasingly popular and the Europeans became interested. German and French men began kayaking for sport. In 1931, Adolf Anderle was the first person to kayak down the Salzachöfen Gorge, which is believed to be the birthplace of modern-day white-water kayaking. Kayak races were introduced in the Berlin Olympic Games in 1936. Kayaks can also be classified by their design and the materials from which they are made. Each design has its specific advantage, including performance, manoeuvrability, stability and paddling style. Kayaks can be made of metal, fibreglass, wood, plastic, fabrics, and inflatable fabrics such as PVC or rubber, and more recently expensive but feather light carbon fiber. Each material also has its specific advantage, including strength, durability, portability, flexibility, resistance to ultraviolet and storage requirements. For example, wooden kayaks can be created from kits or built by hand. Stitch and glue, plywood kayaks can be lighter than any other material except skin-on frame. Inflatable kayaks, made from lightweight fabric, can be deflated and easily transported and stored, and are considered to be remarkably tough and durable compared to some hard-sided boats. There are many types of kayaks used in flat water and whitewater kayaking. The sizes and shapes vary drastically depending on what type of water to be paddled on and also what the paddler would like to do. The second set of essentials for kayaking is an off-set paddle where the paddle blades are tilted to help reduce wind resistance while the other blade is being used in the water. These vary in length and also shape depending on the intended use, height of the paddler, and the paddler's preference. Kayaks should be equipped with one or more buoyancy aid (also called flotation) which creates air space that helps prevent a kayak from sinking when filled with water. A life jacket should be worn at all times (also called a personal flotation device or PFD), and a helmet is also often required for most kayaking and is mandatory for white water kayaking. Various other pieces of safety gear include a whistle for signaling for help; throwing ropes to help rescue other kayakers; and, a diving knife and appropriate water shoes should used depending upon the risks the water and terrain pose. Proper clothing such as a dry suit, wetsuit or spray top also help protect kayakers from cold water or air temperatures. "Sit on top" kayaks place the paddler in an open, shallowly-concave deck above the water level. 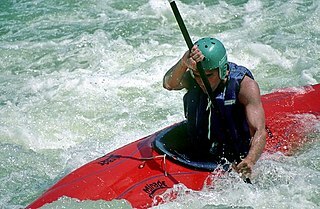 This style is usually used for non-white water activities as most find it harder to stay inside the kayak while also preventing them from "rolling" which allows the user to upright themselves if they flip over. There are some benefits to sit on tops such as the ability for a "dry hatch" these are a compartment, that usually runs the length of the kayak, which in addition to providing more buoyancy allows for the kayaker to store various equipment in. "Sit on top" kayaks often use "through holes" which allows any water that got in the boat to make it through the deck and dry hatch to drain. "Cockpit style" involves sitting with the legs and hips inside the kayak hull with a spray deck or "spray skirt" that creates a water-resistant seal around the waist. There is a wide range of "cockpit style" boats which usually allow for more user control of the boat as they are able to push against the walls of the boat to tip in order to complete maneuvers. A common variant of "cockpit style" kayaks are "play boats" these are usually very short kayaks in which the user does tricks and maneuvers: "Inflatables" are a hybrid of the two previous configurations; these boats have an open deck, but the paddler sits below the level of the deck. These boats are often subject to more instability due to the way the boat sits higher in the water. They are often used in a more commercial setting, they are often affectionately called "Duckies". "Tandems" are configured for multiple paddlers, in contrast to the single person designs featured by most kayaks. Tandems can be used by two or even three paddlers. Because of their range and adaptability, kayaks can be useful for other outdoor activities such as diving, fishing, wilderness exploration and search and rescue during floods. Kayak diving is a type of recreational diving where the divers paddle to a diving site in a kayak carrying all their gear to the place they want to dive. The range can be up to several kilometres along the coastline from the launching point to a place where access would be difficult from the shore, although the sea is sheltered. It is a considerably cheaper alternative to using a powered boat, as well as combining the experience of sea kayaking at the same time. Kayak diving gives the diver independence from dive boat operators, while allowing dives at sites which are too far to comfortably swim, but are sufficiently sheltered. Kayak fishing is fishing from a kayak. The kayak has long been a means of transportation and a stealth means of approaching easily spooked fish, such as cobia and flounder. Kayak fishing has gained popularity in recent times due to its broad appeal as an environmentally friendly and healthy method of transportation, as well as its relatively low cost of entry compared to motorized boats. In addition, kayaks allow greater access by their ability to operate in shallow water, getting in and out along the shoreline, and having the ability to get away from the crowds to find a more solitary environment where boats may not have the ability to do so. Ecotour guide stands on a kayak, spotting dolphins and manatees around Lido Key. Ecotourism based on kayak trips is gaining in popularity. In warm-water vacation destinations such as Sarasota Keys, guided kayak trips take kayakers on a tour of the local ecosystem. Kayakers can watch dolphins breach and manatees eat seagrass, in shallow bay water. One of the most common uses of kayaks for hobbyists is whitewater kayaking. Whitewater kayaking is when a kayaker traverses down a series of rapids. The difficulty of these rapid ranges from Class I to Class VI. The difficulty of rapids often changes with water level and debris in the river. Debris that inhibits a kayakers path are often called "strainers" as they "strain" out the kayakers like a colander. There are often training camps as well as man-made structures to help train kayakers. ^ "ICF - Canoeing, Kayaking and Rowing: So what's the difference anyway?". Canoeicf.com. Archived from the original on August 15, 2012. Retrieved 2013-11-07. ^ "Kayak Review". Kayak Review. Retrieved July 18, 2015. ^ "Kayak Manual". Kayak Manual. Retrieved September 8, 2018. ^ "The Interesting History of Kayaks and the Sport of Kayaking". surftosummit.com. Archived from the original on 2015-07-06. Retrieved 2015-07-06. ^ "History of the Kayak". coastmountainexpeditions.com. Retrieved 26 November 2018. ^ McWilliams, Sarah. "Origins: The History of Kayaking". Athletic Training Lifestyle. Retrieved 24 November 2018. ^ "History of Kayaking - HowStuffWorks". Retrieved 2015-07-06. ^ Parker, Christopher J.; May, Andrew; Mitchell, Val (2013). "The Role of VGI and PGI in Supporting Outdoor Activities". Applied Ergonomics. 44 (6): 886-94. doi:10.1016/j.apergo.2012.04.013. ^ Brown, Kevin. "What Is Best For You; An Inflatable Kayak Or A Hard-Shell Kayak?". Surf to Summit. Archived from the original on July 21, 2015. Retrieved July 18, 2015. ^ "Inflatable vs. Hardshell Kayaks". Kayak Guru. ^ "Kayak Safety – Essential Paddling Safety Tips". Globo Outdoors. Retrieved 19 January 2018. ^ Bigelow, Jodi (2008). Kayaking for Fitness. The Heliconia Press. Retrieved 13 July 2015. ^ "American Canoe Association: Paddling 101: A Newcomer's Guide to Safe Canoeing and Kayaking" (PDF). ^ "Why a sit-on-top kayak?". Ocean Kayak. Retrieved July 18, 2015. ^ "Kayaking News". Paddle Lake Erie. Retrieved June 27, 2018. ^ "Equipments". Wiltshire Search and Rescue. Archived from the original on July 22, 2015. Retrieved July 18, 2015. ^ Francis, John (August 2003). "Kayak diving". How to Scuba Dive. Scuba Diving magazine. Retrieved 23 February 2014. ^ "Cost Effective Fishing". Retrieved 7 August 2016. ^ White, Jerry. "Why Fish From a Kayak". Paddling.com. Retrieved 24 November 2018. ^ "Kayak Coasting, SRQ Magazine(2015)". Retrieved 2017-04-02. ^ "U.S National White Water Center". A kayak is a small, narrow watercraft which is typically propelled by means of a double-bladed paddle. The word kayak originates from the Greenlandic word qajaq. Whitewater is formed in a rapid, when a river's gradient increases enough to generate so much turbulence that air is entrained into the water body, that is, it forms a bubbly or aerated and unstable current; the frothy water appears white. The term is also loosely used to refer to less turbulent, but still agitated, flows. A sea kayak or touring kayak is a kayak developed for the sport of paddling on open waters of lakes, bays, and the ocean. Sea kayaks are seaworthy small boats with a covered deck and the ability to incorporate a spray deck. They trade off the maneuverability of whitewater kayaks for higher cruising speed, cargo capacity, ease of straight-line paddling, and comfort for long journeys. Whitewater kayaking is the sport of paddling a kayak on a moving body of water, typically a whitewater river. Whitewater kayaking can range from active, moving water, to demanding, extreme whitewater. A spraydeck is a flexible waterproof cover for a boat with holes for the passengers' waists. Spraydecks are used to prevent water from entering the boat while allowing passengers to paddle or row. An inflatable boat is a lightweight boat constructed with its sides and bow made of flexible tubes containing pressurised gas. For smaller boats, the floor and hull is often flexible, while for boats longer than 3 metres (9.8 ft), the floor typically consists of three to five rigid plywood or aluminium sheets fixed between the tubes, but not joined rigidly together. Often the transom is rigid, providing a location and structure for mounting an outboard motor. Canoe slalom is a competitive sport with the aim to navigate a decked canoe or kayak through a course of hanging downstream or upstream gates on river rapids in the fastest time possible. It is one of the two kayak and canoeing disciplines at the Summer Olympics, and is referred to by the International Olympic Committee (IOC) as Canoe/Kayak Slalom. The other Olympic canoeing discipline is canoe sprint. Wildwater canoeing is a non-Olympic paddlesport. Surf kayaking is the sport, technique, and equipment, used in surfing ocean waves with kayaks. Surf kayaking has many similarities to surf board surfing, but with boats designed for use in surf zones, and with a paddle. A number of kayak designs are used, but all are aimed at better using the waves to propel the craft. Canoe diving and Kayak diving are recreational diving where the divers paddle to a diving site in a canoe or kayak carrying all their gear in or on the boat to the place they want to dive. Canoe or kayak diving gives the diver independence from dive boat operators, while allowing dives at sites which are too far to comfortably swim, but are sufficiently sheltered. Creeking is a branch of canoeing and kayaking that involves descending very steep low-volume whitewater. It is usually performed in specialized canoes and kayaks specifically designed to withstand the extreme whitewater environment in which the activity occurs. In addition, the canoes and kayaks give the paddler improved performance and maneuverability needed to avoid river obstacles. A kayak roll is the act of righting a capsized kayak by use of body motion and/or a paddle. Typically this is done by lifting the torso towards the surface, flicking the hips to right the kayak, and applying a small force by means of the paddle to assist the torso back over the boat. Packraft and trail boat are colloquial terms for a small, portable inflatable boat designed for use in all bodies of water, including technical whitewater and ocean bays and fjords. A packraft is designed to be light enough to be carried for extended distances. Along with its propulsion system and safety equipment the entire package is designed to be light and compact enough for an individual to negotiate rough terrain while carrying the rafting equipment together with supplies, shelter, and other survival or backcountry equipment. Modern packrafts vary from inexpensive vinyl boats lacking durability to sturdy craft costing over US $1,000. Most weigh less than nine pounds (4 kg) and usually carry a single passenger. The most popular propulsion systems involve a kayak paddle that breaks down into two to five pieces. Most often they are paddled from a sitting position, although kneeling can be advantageous in some situations. Whitewater canoeing is the sport of paddling a canoe on a moving body of water, typically a whitewater river. Whitewater canoeing can range from simple, carefree gently moving water, to demanding, dangerous whitewater. River rapids are graded like ski runs according to the difficulty, danger or severity of the rapid. Whitewater grades range from I or 1 to VI or 6. Grade/Class I can be described as slightly moving water with ripples. Grade/Class VI can be described as severe or almost unrunnable whitewater, such as Niagara Falls. Snow boating or snow kayaking is a somewhat newer winter sport typically done by kayakers. It usually involves kayakers descending snow slopes, in contrast to river sports such as whitewater kayaking for which the boats were usually designed. Snow boating is typically done in the backcountry and occasionally at resorts and ski areas. Races are held in a modus similar to those of snowboarding they are known as a boatercross. In the races, kayakers race to a finish line or point.